Cleveland Metroparks, together with Cleveland Clinic and Cleveland Clinic Children's, kicks-off 'Explore Your Park.' The initiative is designed to help improve the health of the community by connecting residents with the vast array of free, local programs, activities and experiences offered by Cleveland Metroparks. "With more than 300 miles of hiking, biking and bridle trails across 18 reservations, it's never been easier to get outside and get active," said Brian M. Zimmerman, Cleveland Metroparks CEO. "The 'Explore Your Park' initiative will drive awareness to our thousands of free recreation and education programs." 'Explore Your Park' is a new, holistic approach to wellness. Customized, location-specific information will be available at 12 Cleveland Metroparks locations, connecting the community with free activities and programming to drive a healthy lifestyle. "We're proud to be able to work with such great partners to contribute to the health and wellness of the community," said Joshua S. Miller, D.O., vice president of Cleveland Clinic's Regional Hospitals and Family Health Centers. "This initiative creates new opportunities in more than 23,000 acres of the Metroparks and encourages our community to improve their health by exploring and being active in the parks." "The wellness initiative coincides with the unveiling of Cleveland Metroparks new brand campaign, 'Time to Explore,'" said Kelly Manderfield, Cleveland Metroparks Chief Marketing Officer. "The campaign is designed to spark curiosity, exploration and discovery, inspiring guests to experience the Park District in new ways." The initiative also includes the launch of clevelandmetroparks.com/GetActiveCLE. 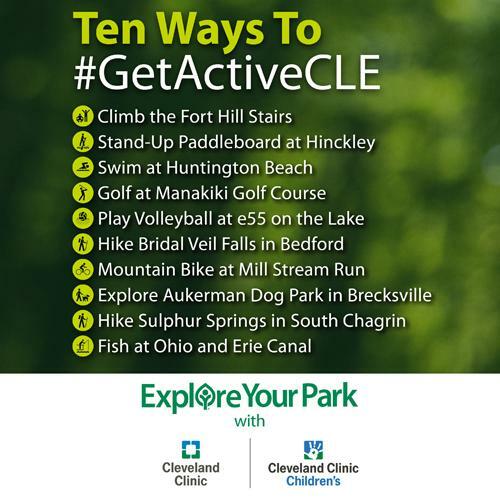 The new webpage will feature wellness tips and videos featuring Cleveland Clinic experts and encourage the community to get out in the parks and share their experience using the hashtag #GetActiveCLE. Cleveland Metroparks looks forward to further engaging the community in their exploration of the Park District through an 'Explore Your Park' Facebook LIVE series. For more information on 'Explore Your Park' with Cleveland Clinic and Cleveland Clinic Children's and 'Time to Explore,' visit clevelandmetroparks.com. Cleveland Metroparks is a National Gold Medal Winning Park District that encompasses more than 23,000 acres in an "Emerald Necklace" around Greater Cleveland. The Park District is home to 18 park reservations, which includes 300 miles of all-purpose, hiking, biking, and bridle trails, eight golf courses, five nature centers and the nationally-acclaimed Cleveland Metroparks Zoo. Evidenced by over 18.5 million recreation visits annually, Cleveland Metroparks features numerous nature-based opportunities for visitors to get active outdoors. Cleveland Clinic is a nonprofit multispecialty academic medical center that integrates clinical and hospital care with research and education. Located in Cleveland, Ohio, it was founded in 1921 by four renowned physicians with a vision of providing outstanding patient care based upon the principles of cooperation, compassion and innovation. Cleveland Clinic has pioneered many medical breakthroughs, including coronary artery bypass surgery and the first face transplant in the United States. U.S. News & World Report consistently names Cleveland Clinic as one of the nation's best hospitals in its annual "America's Best Hospitals" survey. Among Cleveland Clinic's 52,000 employees are more than 3,600 full-time salaried physicians and researchers and 14,000 nurses, representing 140 medical specialties and subspecialties. Cleveland Clinic's health system includes a 165-acre main campus near downtown Cleveland, 11 regional hospitals, more than 150 northern Ohio outpatient locations - including 18 full-service family health centers and three health and wellness centers - and locations in Weston, Fla.; Las Vegas, Nev.; Toronto, Canada; Abu Dhabi, UAE; and London, England. In2017, there were 7.6 million outpatient visits, 229,000 hospital admissions and 207,000 surgical cases throughout Cleveland Clinic's health system. Patients came for treatment from every state and 185 countries. Visit us at clevelandclinic.org. Follow us at twitter.com/ClevelandClinic. News and resources available at newsroom.clevelandclinic.org.